Front Row, L-R: Carolyn Forbes, Joyce England Fly, Judy Hulme Beuchert, Gwen Martin Lucion, Faye Tucker Buchanan, Jackie Funkhouser Tanner, & Shirley Mescal Greer Korman. Second Row: Henry Lucion, George L. Counts, Ed Fly, Don Rankin, Bill Tolley, Roy Hall, & Larry Hylton. Third Row: Roberk Piercy, Wayne Richardson, John Summers, Walter S. Foster, Larry Matney, David Atkins, Pete Plymale, & Willis Hubbard. 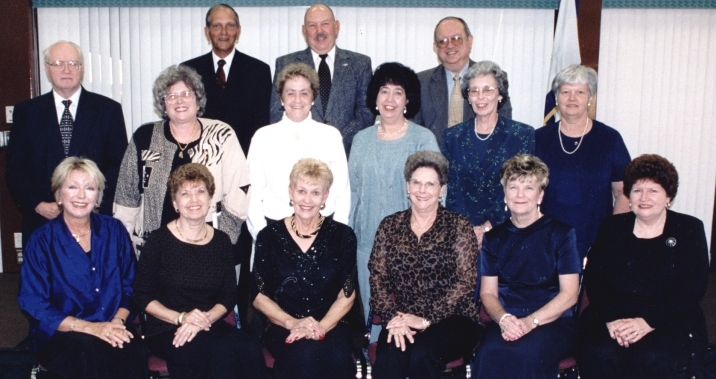 Front Row, L-R: Joan Willis Corney, Connie Moore Jenkins, Daune Hall McCulloch, Eloise Lester Webb, Carol Sue Lawrence Benson, & Eleanor Triplett White. Second Row: Henry Murray, Martha Ann Phipps Shirley, Phyllis Smith Johnson, Euwilda Roberts Lewis, Shirley Price Tolley, & Grace Swetnam McCray. Third Row: Barney Jenkins, Archie Verdiglione, & John Radochio. Front Row, L-R: Rush Floyd, Nilda Ramella, Maria Forbes Shover, Jeanne Grogan Batten, Brenda Muncy McPeak, Pat Donnelly Bradley, Wanda Goad Wertz, Evelyn Sheffey Tomlin, Ann Tucker Rosch, Anne Barnes Williams, & Lila Snow Cline. Second Row: Jo Ed Phillips, Joyce Ann Hall Casto, Geraldine Rotenberry Salcines, Shelby Rotenberry Robertson, Fairy Harper Christian, Faye Tolley Milam, Cuzzie Belcher Mathena, Margaret Campbell Barker, Barbara Mitchell Howlett, & Anita Collins Martin. Third Row: J. M. Yielding, Sam Spangler, Tony Miano, Pete Bignotti, Kenny Crabtree, Richard Clark, Jerry Farris, Dexter Dillon, Andy Tolnay, Ron Thompson, Charles "Bud" Donchatz, Jim Friel, Mike Callaway, & Tom Cloer.